This is from the SF Bay View. Phoenix, Ariz. – A united front of Black and Latino Arizonans mobilized against a state law that they see as a threat to their civil rights on Sunday, April 25, at the First Institutional Baptist Church in downtown Phoenix. Gov. Jan Brewer signed SB 1070 into law on Friday, making Arizona the first state in the nation to make it a crime for a person to be undocumented. More than 3,000 people demonstrated outside the state capitol and hundreds gathered at the church to protest the law. Human rights activists, religious leaders and congressmen called for peaceful mobilizations, boycotts and, if necessary, civil disobedience to stop the legislation they believe would lead to racial profiling, unsafe communities and economic turmoil. Several voices from the African-American community and other ethnic minorities joined the fight, sending a message of unity at a time when the state faces a divisive immigration debate. “We here in Arizona are witnessing the historic and necessary 21st century awakening of the spirit of the civil rights movement,” said Rev. Warren Stewart, to an audience of 300 people at the First Institutional Baptist Church. Other speakers included Mayor Phil Gordon and Congressman Luis Gutiérrez, D-Ill.
Stewart presented a battle plan to the audience that mirrored the strategy the Black community in Phoenix used successfully in 1989 to force an unwilling legislature to create a legal holiday honoring Dr. Martin Luther King Jr. This included an economic boycott. And history might repeat itself. 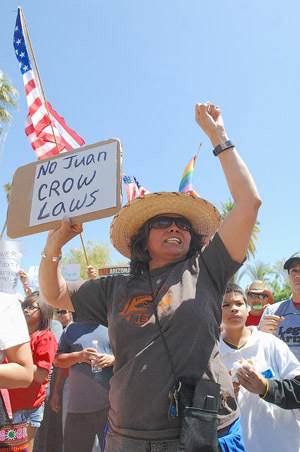 One of the leading voices for a boycott is Congressman Raúl Grijalva, D-Ariz. But before considering a boycott, Congressmen Ed Pastor, D-Ariz., and Luis Gutiérrez, D- Ill., say they want to see direct action from the Obama administration to block enforcement of the new law that would take effect in August. “We need to stop this type of legislation from going to other states,” Pastor told New America Media. The congressman said President Obama can ask U.S. Attorney General Eric Holder to seek a temporary injunction of the Arizona law through the courts. He is also calling on Obama to suspend the use of a national program known as 287(g) that allows local police to enforce federal immigration law and has led to lawsuits related to racial profiling. Congressman Gutiérrez said he is hopeful that Obama will take action to stop the enforcement of SB 1070 given the president’s recent statements. On Friday, Obama said federal inaction in passing immigration reform had led to “irresponsibility by others,” a reference to the Arizona law. Gutiérrez called for immigration reform during a passionate speech in front of the Arizona Capitol, but stressed that even if reform does not pass, that is no excuse not to stop the Arizona legislation in its tracks. He called on the administration to issue a statement to affirm that “the police do not have an inherent right to carry out immigration policy,” and that that is the responsibility of the federal government. But, he said, agreements between local police and immigration authorities across the country may have paved the way for the Arizona law. “Every time the federal government said that you can carry out 287(g) and sanctioned it, you gave Arizona an excuse to do 1070,” he said in a speech Sunday at the Arizona Capitol. Sunday’s protest was the culmination of a week of actions in Phoenix, including an act of civil disobedience on Tuesday by nine students who chained themselves to the doors of the state capitol. People gathered to the beat of ranchera music in a rally that had a cheerful tone to it, despite the nature of the protest. T-shirts with the message “Legalize Arizona” were distributed in the crowd, which was made up mostly of young people and families with children. The peaceful rally contrasted with the presence of hundreds of officers from the Department of Public Safety (DPS) who surrounded the premises of the Capitol grounds. Another rally is expected on May 1, when communities across the country will call for immigration reform. “This had the unintended result of bringing people together who are vulnerable and live this vulnerability day in an day out. The African-American community, the Native American community, the gay American community,” said Roberto Reveles, former president of Somos America, a human rights coalition in the state. Reveles, who participated in the 1960s civil rights movement, believes the passage of the controversial law will lead to more civic involvement and voter registration. “We feel this is our fight also,” said Robert Tindall, director of Equal Means Equal, a campaign to bring awareness to gay rights issues. “It’s about equal rights and civil rights.” Tyndall said his group used social networking sites like Twitter to inform about 6,000 people about the rally on Sunday. While communities are planning actions on the ground, others are looking to challenge the new law in the courts. The American Civil Liberties Union (ACLU) and the Mexican American Legal and Educational Fund (MALDEF) are looking into an immediate legal challenge. Phoenix Mayor Phil Gordon said the city also will consider a lawsuit. But there is a question of timing. One of the most immediate challenges to stop the law from taking effect is based on the argument that the federal authority is supreme when it comes to enforcing immigration law and states can’t regulate that area. Another challenge, which would have to take place after the law has gone into effect, could investigate whether the law has resulted in the use of racial profiling. Sen. Russell Pearce, R-Mesa, the author of the legislation, argues that his bill is not any different from what the federal government already does. 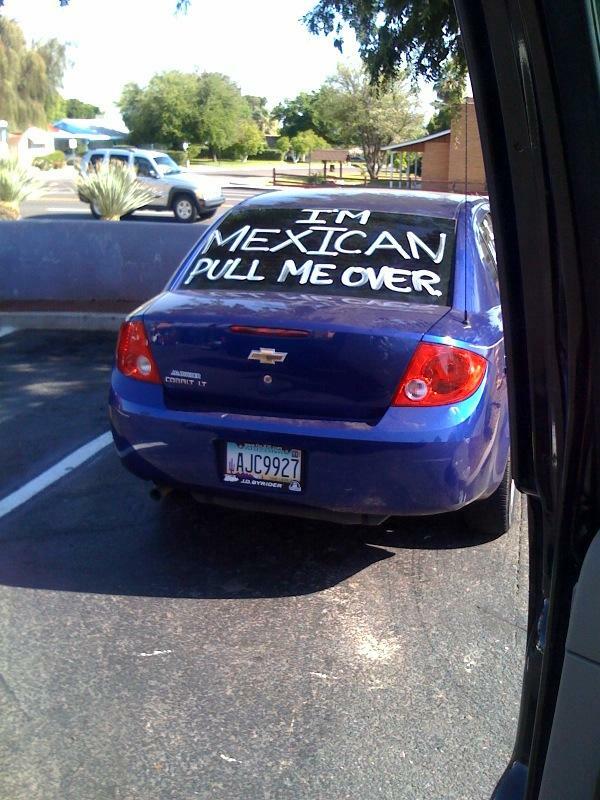 But legal observers say the fact that federal law supersedes state law could be the crux of the case against SB 1070.